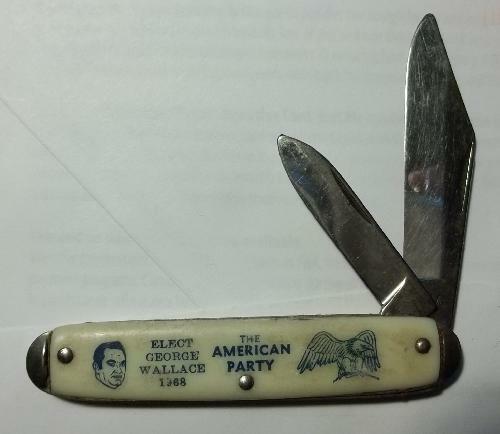 The American Party. 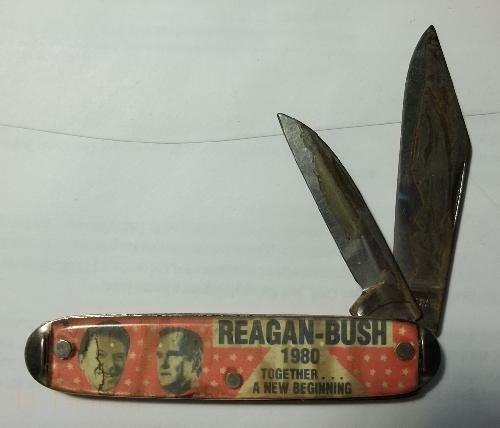 This two blade knife is marked U.S.A. at the base of the long blade. Yours for $19.95 $5.60 for Priority Mail added at checkout. Yours for $14.95 $5.60 for Priority Mail added at checkout. 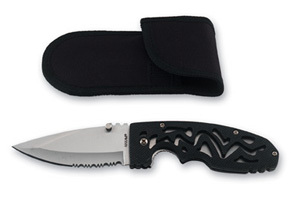 CAMP · USATM 4" Lockback Knife Features 420 Japan stainless steel blade, glass filled nylon handle, metal clip and easy one-hand opening Carded 1 lb Half-serrated. Yours for $4.95 $2.95 for postage added at checkout. Yours for $6.95 $2.95 for postage added at checkout. Yours for $6.95 2.95 for postage added at checkout. Yours for $8.95 $3.95 for postage added at checkout. 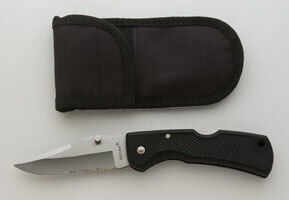 Maxam ® "Rock" Extra Heavy Duty Lockback Knife with LeymarTM handle This knife features a AISI 420J2 surgical stainless Japan steel blade that is 1/8" thick, nearly twice as thick as many ordinary pocket knives, which provides for a more secure lock. The Rock is perfect for skinning an animal and sturdy enough for the daily use of an electrician or carpenter. Comes with a KelvlonTM pouch Measures 4-5/8" closed and 8-1/2" open. Yours for $9.95 $4.95 for postage added at checkout. 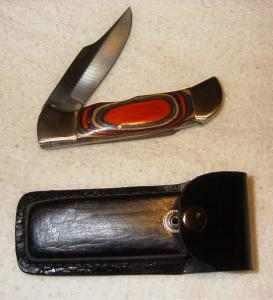 MAXAM Lockback Knife with key chain and Gift Box.. Total knife length 4-1/2 inches. Blade length is: 1-13/16" Features stainless steel, half-serrated blade, glass filled nylon handle with easy one-hand opening. Yours for $2.95 $2.95 for postage added at checkout. Beautifully layered multicolor handles grace this 9 inch folding knife. Blade length is 4 inches. Stainless steel blade locks securely in place when open. REAL leather case with steel button fastener. Case is slotted (in back) for wearing on YOUR belt. Yours for $12.95 $4.95 for postage added at checkout. © Copyright 2005 - 2014 A product of Perkins e-Enterprises. All Rights Reserved.